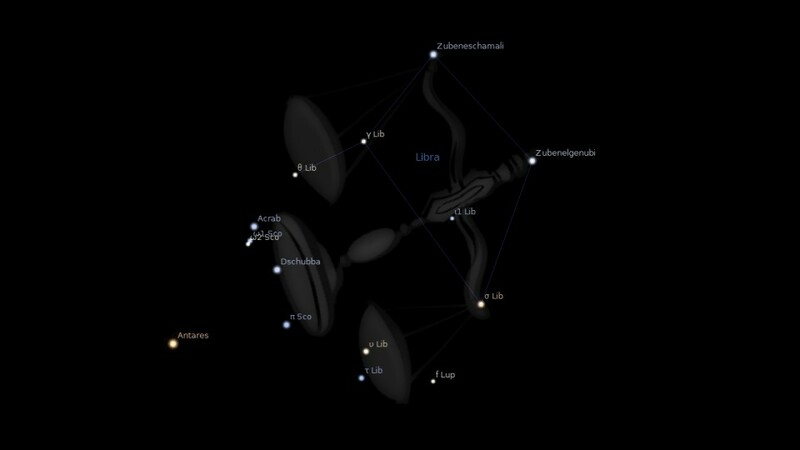 Constellation Libra the Scales, or The Claws of the Scorpio, is an ecliptic constellation laying between constellation Virgo and constellation Scorpio. It contains seven named stars and spans 15 degrees of the zodiac in the sign of Scorpio. The Libra constellation has only two stars of significant in astrology. These two Scales of the Balance accurately measure the good and the bad in a soul. If the sum of the positives equals the sum of the negatives, the Scales balance out in equilibrium. When there is an imbalance, these two stars take corrective action to return equilibrium. They deliver justice to balance the karmic budget, punishing hate and rewarding love. Each Scale above measures different things, and each has a different influence on events below. The South Scale Zubenelgenubi is the Insufficient Price. When bad deeds outweigh good, Zubenelgenubi measures the Price of the Deficient. Zubenelgenubi delivers loss, disappointment and suffering until the debt is paid off. The North Scale Zubeneschamali is the Full Price. Sacrifice and love have atoned for previous misdeeds. The karmic surplus is the price which covers the good fortune, happiness and success delivered by Zubeneschamali. 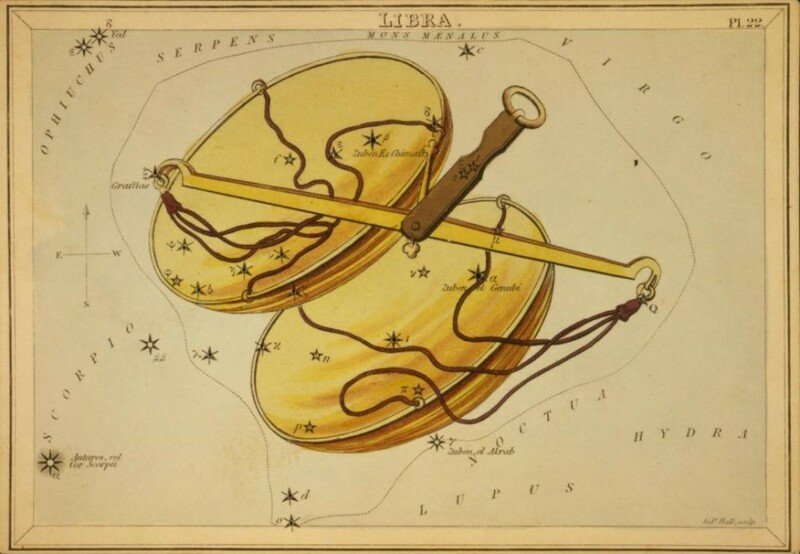 “Libra was not considered a separate constellation by the ancients and was called Chelae, or the Claws of Scorpius, which sign was made to consist of 60°. The present constellation figure is said to represent the balance wherein Astraea weighed the deeds of men and presented them to Jupiter. The early Greeks did not associate its stars with a Balance, so that many have thought it substituted in comparatively recent times for the Chelae, the Claws of the Scorpion (Scorpius), that previously had been known as a distinct portion of the double sign. The Romans claimed that it was added by them to the original eleven signs, which is doubtless correct in so far as they were concerned in its modern revival as a distinct constellation, for it first appears as Libra in classical times in the Julian calendar which Caesar as pontifex maximus took upon himself to form, 46 B.C., aided by Flavius, the Roman scribe, and Sosigenes, the astronomer from Alexandria. While it seems impossible to trace with any certainty the date of formation of our present figure and its place of origin, yet there was probably some figure here earlier than the Claws, and formed in Chaldaea in more shapes than one; indeed, Ptolemy asserted that it was from that country, while Ideler and modern critics say the same. It seems not unreasonable to conclude that in Chaldaea the 7th sign had origin in all its forms. In classical astrology the whole constituted the ancient House of Venus, for, according to Macrobius, this planet appeared here at the Creation; and, moreover, the goddess bound together human couples under the yoke of matrimony… and governed the lumbar region of the human body. Its modem reign has been over Alsace, Antwerp, Austria, Aethiopia, Frankfurt, India, Lisbon, Livonia, Portugal, Savoy, Vienna, and our Charleston; but in classical times over Italy and, naturally enough from its history, especially over Rome, with Vulcan as its guardian. It thus became Vulcani Sidus. To it was assigned control of the gentle west wind, Zephyrus, [This was the same as Roman Favonius, — at first regarded as strongly blowing, but later as the genial Zephyros, the Life-bearing] personified as the son of Astraeus and Aurora. The Hebrew name is Mozanaim, the Scales, weighing. Its name in Arabic is Al Zubena, pruchase, or redemption. In Coptic, it is Lambadia, station of propitiation (from Lam, graciousness, and badia, branch). The name by which it has come down to us is the Latin, Libra, which means weighing, as used in the Vulgate (Isa 40:12). There is, however, some reason to suppose that Libra is a very ancient Egyptian corruption, bringing in human merit instead of Divine righteousness; “the way of Cain” instead of the way of God. In the more ancient Akkadian the months were called after the names of the signs, and the sign of the seventh month is the sign that we now call Libra. The Akkadian name for it was Tulku. Tul means mound (like dhul and dul), and ku means sacred; hence, Tulku means the sacred mound, or the holy altar. 1. Fixed Stars and Constellations in Astrology, Vivian E. Robson, 1923, p.49-50. 2. Astronomica, Manilius, 1st century AD, book 4, p.239. 3. Star Names: Their Lore and Meaning, Richard H. Allen, 1889, p.269-275. 4. The Witness of the Stars, E. W. Bullinger, 5. Libra (the Scales). Zi-bi-an-na ‘Scales’ (Libra) represented sungod, Shamash in his role as God of Truth and Justice. The scales was sacred to him. The Babylonians viewed Libra as strong, favorable placement for the Sun and not a fall placement for the Sun like most astrologers do.